Hay una receta para cada momento especial con Kroger! There’s a recipe for every moment we value with Kroger! 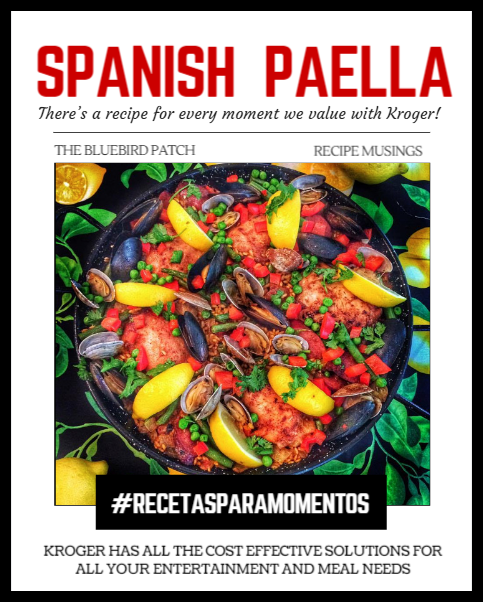 A few weeks ago, my local Kroger had a “Taste of Spain” event and for the first time they were selling paella kits. I was so excited to see the “paelleras” displayed as soon as you entered the store, because for the longest time, I've been wanting to make Spain's most famous dish: that sumptuous combination of saffron rice, chicken and shellfish known as paella. I mean, coming from a Puerto Rican household were rice is part of our daily diet, I questioned how complicated could it really be? The reality is that making Spanish paella sounds easy, but it takes a bit of practice to master. Making paella is similar in concept to risotto, but with the added bonus that the trick is not to stir the rice. Cooking a paella requires high heat for sautéing and then moderate to low heat for simmering. The flavor base of the paella, sofrito is traditionally a mixture of onion, garlic and fresh grated tomato. Make sure it's well cooked to give the paella a rich deep flavor. Paellas need to be cooked with a good amount of oil. The oil helps keep the starchy rice grains separate and carries the flavors of the sofrito through the dish. If you are using an electric cooktop or if your burner is too small your paella could tend to cook more on one side than the other, so if this is the case, you must rotate the pan for even cooking or finished it in the oven. This recipe is intended to show you the basic steps of a paella. By any chance this is a traditional paella but a latin-inspired paella dish since we are using Latin style rice instead of the traditional Calasparra or Bomba Rice, and Sazon with Azafran instead of saffron. All the ingredients for this recipe can be found at Kroger. I really like shopping at Kroger because it has great quality food and always at low prices. I can also find recipes and entertaining tips to help me stretch my budget and create dishes that are delicious and save me money. I love shopping at Kroger because they have quality, affordable brands that make life a little easier and eating more delicious, all under one roof! Kroger lets me focus on budget friendly meals. I adore their app and I use it at least 3-4 times a week. I'm constantly loading online coupons directly to my Shoppers Card and my shopping list. I can also view Weekly Ads and quickly add Weekly Ad items to my shopping list and let's not forget Kroger FREE Friday download that you can redeem in store within 2 weeks. When it comes to Kroger products one of my favorites is Private Selection™ mainly because they carry gourmet and artisan products and the brand places an emphasis on fresh, authentic ingredients. Kroger brands stretch from corner to corner of the store, with over 10,000 quality items that families know they can trust. These include Kroger, Big K®, Wholesome@Home™, Fresh Selections by Kroger®, Home Sense®, Comforts for Baby®, Private Selection™ and Simple Truth®. Plus, stay on budget while feeding your family meals they’ll love with our P$$T…™, Check This Out... and Heritage Farm™ brands. Now my local Kroger is AMAZING! I feel so spoiled because it has a Starbucks shop inside, an amazing flower station, they sell gourmet cheeses, and fresh raw seafood. They also have fresh-baked brick-oven pizza and a sushi bar where you can order your favorite sushi meal. But that's not all, they also added a gorgeous olive & antipasti bar that is divine! There is a recipe for every moment we value. Paellas is one of those special dishes that bring people together at the table because is a dish that its meant to be shared. When I make Paella I serve it family style. We eat it from the perimeter and work our way toward the center. Add chicken stock to sauce pan and bring to a slow boil. Add 1 package of Sazon with Azafran (saffron) and salt to taste. Turn off the heat add leave stock to be infused with saffron mix. You can find the rice and the Sazon on aisle 5! Place paella pan on burner on medium high heat. Add olive oil till you see light smoke. Add chicken till it browns. Add paprika, salt and pepper. Continue cooking for 5 minutes. Remove chicken from the pan and brown the duck sausage. Return chicken to the pan, add sofrito of grated tomatoes, onions and garlic, stir well. Saute for an additional 5 minutes. Add the chicken stock to paella pan. Stir all ingredients well. Bring to a boil. Add rice and mix well. Once you add the rice and have mixed well, do not stir paella again. Lower temperature to a low heat and simmer rice for 20-30 minutes depending on your heat source. When the rice has absorbed most of the liquid but it's still wet (about 5 minutes before the rice absorbs all the chicken stock) Cook mussels and clams according to package instructions and add them to the paella. Once you can not see any more liquid. Turn off heat, cover with a towel for 10 minutes. The rice will continue absorbing the stock and all its delicious flavors. Remove the cover and garnish with peas, red pepper and chopped cilantro. Squeeze lemon to the paella and place lemon wedges around the cooked paella for presentation. To test whether the paella is cooked, use a spoon to taste a little rice from the edge of the pan – this rice will be cooked last as it's the furthest away from the heat in the centre. When ready, the rice should be tender yet firm to the bite. If it's not cooked, pour over a little more hot stock or boiling water. The socarrat (soh-kah-raht, from the verb socarrar, which means to toast lightly) is the caramelized crust of rice that sometimes sticks to the bottom of the pan and is considered the tastiest part of the paella. To ensure you don't miss out, increase the heat at the end of cooking, paying close attention to the sound of the rice (it crackles) and the smell (toasty but not burned). After one or two minutes, poke under the foil with a spoon; if you feel just a touch of bumpy resistance on the bottom of the pan, you've got socarrat. Click here to find your nearest Kroger location.